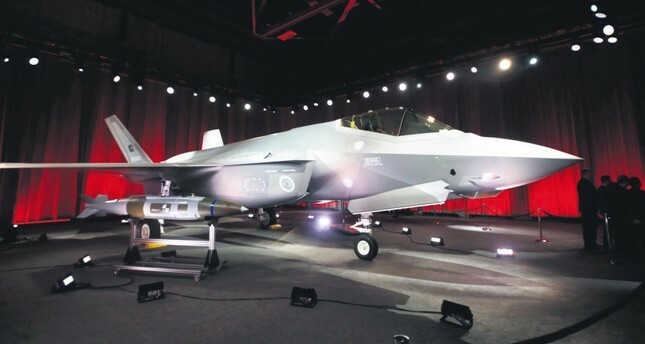 The first two F-35 jets were delivered to Turkey, one of the main partners of the F-35 Lightning II Joint Striker Program, in a ceremony in June 2018 at Lockheed Martin’s facilities in Fort Worth, Texas. Washington has flexed its muscles against Turkey on the dispute over Ankara's purchase of the S-400 missile system, putting forth the acquisition of the Russian-made weapon as a pretext to stop the delivery of F-35 jet fighter aircraft to Turkey. However, considering that NATO and other member countries previously announced that the S-400 purchase is Turkey's sovereign decision and does not pose a problem with Ankara's role in the bloc, it becomes evident that Washington's threatening tone points to an intention to try and keep a tight rein of Ankara's foreign policy. On Monday, the U.S. halted the delivery of equipment related to the F-35 stealth fighter aircraft to Turkey, marking the first concrete step by Washington to block delivery of the jet to NATO ally Turkey. Arda Mevlütoğlu, a defense industry expert, told Daily Sabah that he does not think that bilateral relations will get back on right track even if the S-400 dispute is somehow solved. "The problems between Turkey and the U.S. are multilayered and very complicated. The S-400 just turned into a 'filter' pushing other problems to the back burner," he said. Turkish officials had refused to back down from the planned purchase of S-400 systems, which, according to Turkey's NATO ally the U.S., would compromise the security of F-35 aircraft. Washington has also been voicing concern over the purchase that would create risk that could harm NATO allies, although the military bloc previously indicated that the acquisition is Turkey's national decision and do not contradict Ankara's position in NATO. Similar to Mevlütoğlu, defense analyst Turan Oğuz said that the S-400 issue is just the tip of the iceberg in bilateral relations, emphasizing that U.S. will demand more concessions even if Ankara abandons the weapons deal with Russia until Turkey completely adjusts its foreign policy accordingly to U.S. interests in the region. "There has been a serious confrontation between Turkey and the U.S. in northern Syria due to Washington's insistence to maintain its support to PKK-affiliated groups. Also, the U.S. started to side with Turkey's rivals in Mediterranean gas fields while demanding Turkey join sanctions against Iran," Oğuz said. Meanwhile, Acting Defense Secretary Patrick Shanahan said yesterday that he expected to solve a dispute with Turkey over its purchase of Russia's S-400 air defense system, a day after the U.S. halted the delivery of equipment related to the F-35 aircraft to Ankara. "I expect we'll solve the problem so that they have the right defense equipment in terms of Patriots and F-35s," Shanahan told reporters at the Pentagon. Washington has sought to persuade Turkey to purchase the Patriot defense system, instead of S-400s. Shanahan added that he expected the delivery of F-35s currently at Luke Air Force base to Turkey. The U.S. military has sent thousands of truckloads of weapons to militants of the PKK's Syrian affiliate, the People's Protection Units (YPG), including heavy weapons under the pretext of fighting Daesh, defying Ankara's warnings that the weapons could eventually be transferred to PKK militants and used against the Turkish army. The U.S. is ramping up efforts to increase its military and diplomatic presence in the region, including Syria, Iraq and the Eastern Mediterranean, to safeguard the interests of its regional allies, particularly Israel. Therefore, U.S. ambitions in the region, which do not take into consideration the interests of its NATO ally Turkey, constitute the fundamentals of the conflict between the two countries. For the first time, U.S. Secretary of State Mike Pompeo also attended the 6th Trilateral Greece-Greek Cyprus-Israel Summit held last month in Jerusalem. Turkish officials previously warned that Ankara would never allow attempts to extort natural resources in the Eastern Mediterranean region without due consideration of the rights of Turkey and the Turkish Republic of Northern Cyprus (TRNC). Ankara's decision to resort to the Russian-made surface-to-air missile (SAM) system is the result of a comprehensive calculation of geopolitical risks compelling the country to look for alternatives to strengthen its defense systems after the U.S. refused to sell similar weapons Turkey. When Turkey wanted to the buy the Patriot missile system from the U.S. in 2009 during Barack Obama's term, U.S. Congress declined the offer for the sale of the Patriot PAC-3 batteries worth $7.8 billion at the time. Though not selling the missile systems to its NATO allies, Washington continued to provide extensive arms support to terror groups in Syria that have continuously attacked Turkey and claimed hundreds of lives. Washington's attempts to create obstacles for Turkey in the F-35 project started in August 2018, when the Trump administration approved a defense budget law delaying delivery of F-35 jets to Turkey, citing Turkey's purchase from the Russians. Two months later, a Pentagon report said Turkey could face expulsion from the F-35 program if it goes ahead with the purchase. Turkey has been in the F-35 program since 1999, and the Turkish defense industry has taken an active role in the production of aircraft and invested $1.25 billion in the aircraft's development. Oğuz said that Turkey's role in F-35 program is based on three aspects - manufacturer, recipient and maintainer - and emphasized that the U.S. could toss aside Turkey but it would create a delay in delivery and create more cost. "Turkish contractors have been producing about 800 parts of the F-35 but the U.S. actually has alternatives for many subsystems. However, aside from its role in the manufacturing process, Turkey has also been considered as the only maintenance center in Europe," he said. Since Turkey is a Level-3 partner in the multinational F-35 project, Turkish defense companies even produce high-end SOM-J missiles for the Joint Strike Fighter program. The country plans to purchase 100 F-35 fighter jets in the coming years. Out of 100 aircraft, 30 have been approved. The country took delivery of its first F-35 fighter jet at a ceremony in Fort Worth, Texas, on June 21, 2018. Two more F-35s are expected to be delivered this month. Mevlütoğlu said that U.S. has been in search for alternatives to Turkish defense companies for a long time and Israeli companies in particular are working to increase their share in the project. "I don't think that Turkey's exclusion will inflict a long-term negative effect on the project but surely this would create more cost and delay the process," he said. In June 2018, the first two F-35 jets have been delivered to Turkey, one of the main partners of the F-35 Lightning II Joint Striker Program. The Turkish defense industry has been playing an active role in the production of the fifth generation F-35 fighter jets. According to the initial plan, the jets remained in the U.S. for training activities and will be shipped to Turkey by November 2019. The country is expected to receive six F-35 jets by 2020. Four of these jets will be staying in the U.S. until 2020 and the two of them will be transferred to the integrated air base in Turkey's eastern province of Malatya. Turkey will receive the remaining 24 jets in the first 30-jet order package by 2024. The country initially ordered 10 F-35 jets. Moreover, Turkey is the maintenance and repair center of Europe for F35 fighter aircraft manufactured under the Joint Strike Fighter (JSF) plan. The engine production and maintenance center, which will be established in the central Anatolian province of Eskişehir, will solely offer warehouse-level maintenance services for three years. The JSF program includes design, development, production and logistic support for F-35 aircraft on a global scale. Along with Turkey, the U.K., Italy, the Netherlands, Canada, Australia, Norway and Denmark are other participants in the program.